In the wake of Brexit and Trump, ‘mainstream’ media have done the formerly unthinkable by focusing on media bias. The intensity of focus has been such that the Oxford Dictionaries have announced that ‘post-truth’ is their ‘Word of the Year 2016’. ‘Post-truth’ refers to ‘circumstances in which objective facts are less influential in shaping public opinion than appeals to emotion and personal belief’. Students of ‘brainwashing under freedom’ will notice that this bears a striking resemblance to 20th century US policy advisor Reinhold Niebuhr’s insistence on the use of ’emotionally potent over-simplifications’ to control the public mind. It’s nothing new, in other words. Now, it seems, anyone ‘serious about liberty’ has to resist the free flow of ugly words for fear of ‘net-induced friction on civil society’. Whatever that means. Smith was reacting to ‘the accidental or deliberate propagation of misinformation via social media’. Many millions of people ‘saw and believed fake reports that the pope had endorsed Trump; Democrats had paid and bussed anti-Trump protesters…’; and so on. Curiously, Smith made no mention of the relentless ‘mainstream’ and social media efforts to link Trump with Putin seen by many millions of people around the globe. Nor did Smith mention the upside of social media – the democratisation of outreach, the related growth in popular support for Jeremy Corbyn and Bernie Sanders, and for left-wing movements like Spain’s Podemos. Like the rest of ‘mainstream’ journalism, Smith had nothing to say about the leading role played by traditional corporate media in the ‘deliberate propagation of misinformation’. A remarkable omission, given the unprecedented ferocity of the smear campaign against Jeremy Corbyn. Facebook readers, then, are sheltered from the giant, global corporate media that dominate our newspapers, magazines, publishing companies, cinema, TVs, radios and computer screens – even though social media are themselves corporate media. And presumably we are to believe that readers of ‘reliable news sources’ – the BBC, Guardian, The Times, Telegraph and other traditional outlets – are forever being exposed to ‘opposing viewpoints’ by these media. With perfect irony, this attack on ‘fake news’ may itself have been faked. Satirist Godfrey Elfwick has since claimed authorship of the Guardian story. Elfwick certainly has form, having previously hoaxed several national news organisations on related issues. ‘Nothing can excuse The Sun’s Page One presentation, under the headline The Truth. So the ‘reputable’ outlets (the BBC calls them ‘legitimate news outlets’) were those producing ‘legitimate stories’. ‘Daily Mirror editor Piers Morgan has been sacked after the newspaper conceded photos of British soldiers abusing an Iraqi were fake. To reiterate, ‘fake news’ is said to refer to ‘websites [that] publish hoaxes, propaganda, and disinformation to drive web traffic’. A simple, table-top experiment can help us understand why this definition can be generalised to all corporate media, not just social media. Place a square wooden framework on a flat surface and pour into it a stream of ball bearings, marbles, or other round objects. Some of the balls may bounce out, but many will form a layer within the wooden framework; others will then find a place atop this first layer. In this way, the flow of ball bearings steadily builds new layers that inevitably produce a pyramid-style shape. This experiment is used to demonstrate how near-perfect crystalline structures such as snowflakes arise in nature without conscious design. We will use it here as a way of understanding Edward Herman and Noam Chomsky’s ‘propaganda model‘ of ‘mainstream’ performance. ‘References may occasionally appear in the press about the great disparities of wealth and poverty in Third World nations, but US corporate imperialism is never treated as one of the causes of such poverty. Indeed, it seems the US press has never heard of US imperialism. Imperialism, the process by which the dominant interests of one country expropriate the land, labor, markets, capital, and natural resources of another, and neo-imperialism, the process of expropriation that occurs without direct colonization, are both unmentionables. Anyone who might try to introduce the subject would be quickly dismissed as “ideological”. Media people, like mainstream academics and others, might recognize that the US went through a brief imperialist period around the Spanish-American War. And they would probably acknowledge that there once existed ancient Roman imperialism and nineteenth-century British imperialism and certainly twentieth-century “Soviet imperialism.” But not many, if any, mainstream editors and commentators would consider the existence of US imperialism (or neo-imperialism), let alone entertain criticisms of it. Given the four framing conditions described above, it is easy to understand why Parenti’s facts and arguments find no place in the corporate media performance ‘pyramid’. This means that everything that appears in the ‘pyramid’ about the West’s relations with the Third World is either fake news, or half-truth presented in a fake context. Cuba’s foreign policy is thus compared to that of the less ‘impressive’ West, rather than presented as a desperate attempt to escape and survive Western imperialism. When the Guardian says that, in Castro, some ‘see a dictator who trampled human rights’, it fails to mention how the British government curtailed democratic freedoms at home when threatened by a far more evenly matched enemy from 1939-1945. 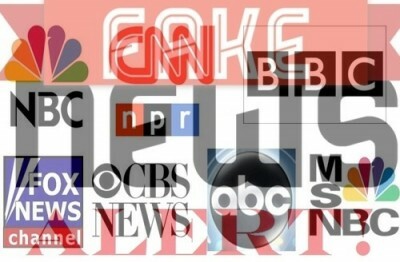 Put simply, it is not reasonable to expect corporate media to report honestly on a world dominated by corporations. With perfect irony, the latest focus on ‘fake news’ is itself fake news because the corporate media never have discussed and never will discuss the framing conditions that make it a leading purveyor of ‘hoaxes, propaganda, and disinformation’.